The Victoria Park AAC team of the 1950’s was all-conquering on the road and over the country – serious opposition was received from Shettleston and Bellahouston Harriers provided stern challengers but the Scotstoun club reigned supreme. The teams of the late 40’s and 60’s were good but this group was, by any stretch of the imagination, great. Ian Binnie and Andy Forbes were the big names and their deeds are known all over the UK and eve wider afield: did Andy not win a silver in the Commonwealth Games and Binnie not set British and Commonwealth records? But there were others of a very high calibre backing them up and even defeating them on occasion and some of them will be portrayed here. I have concentrated on two races – the National and the Edinburgh-Glasgow Relay – as a measure of their talent simply because space would not allow detailed examination of their entire careers: most of them were very good on the track as well – check the records! When I started in the sport RONNIE KANE was running well enough but past his prime and running on the roads. Speaking to him in dressing rooms and tents at Highland Gatherings, I knew him as a fine man, very friendly and easy to get on with but I had not the faintest notion of how good he had been. What I will do is simply list some of his achievements and let them speak for themselves. First the Edinburgh to Glasgow. 1952 Second 2nd fastest He came from second to first! There are several excellent performances there but the one that catches the eye is that of 1952 when, in only his second run in the event, he took on the very difficult second stage, pulled his team into first place and turned in the second quickest time on the stage. His running in the National Cross Country was even more impressive. In 1954 he was not only fourth across the finishing line but first club runner with the second VP man in thirteenth. Again a wonderful set of results in Scotland’s premier cross-country event. I can’t give all his results here but the above is an indication of how good a club man he was. He ran well into the 1960’s before starting to coach the Victoria Park youngsters and men like Alastair Douglas and Peter McGregor passed through his hands. He also had very good women athletes with Lynne MacDougall, Fiona McQueen and Judith Shepherd being among them. It was a real blow to the athletics community when he died tragically early. The other man in the photograph at the top is JOHN McLAREN from Shotts. John had a withered left arm but this did not seem to stop him – remember cross-country had fences, barbed wire and the lot in the 50’s. John was a bit younger and he overlapped two very good club teams in the second half of the 50’s and ten years later was still a key member of the team. He first came to notice as a Junior when he won the Scottish Cross-Country Championships in both 1954 and 1955 running for Shotts. By 1956 he was a member of Victoria Park and was their first counter when he was fifth in the National – four places ahead of another first year senior, Bobby Calderwood. In 57 he was third, in 58 he was fifth, in 59 second, in 60 ninth, he did not run in 1961 but a year later he was seventh. Not surprisingly he picked up six international cross-country vests – in 1955*, ’56*, ’57*, ’58, ’59* and ’62. The starred years were when he was first Scots counter in the event and his best performance was twelfth in 1957. A staunch Scottish Nationalist his war cry of “Guid Aul’ Scotland” as he crossed the finishing line was one of his trademarks and after his running career was over, he took up local politics and was often seen at Highland Games meetings in Shotts wearing his kilt. On the road he ran in eleven E-G’s between 1956 and 1968. He ran only on Stage Four up until 1966 and in his first run he set a stage record and followed up with stage best times in ’57, ’58, ’59 and ’61 before being second fastest to Andy Brown of Motherwell in ’62 and ’63. In ’64 he was fourth fastest with Andy Brown again quickest on the stage and then, after missing 1965, he was third fastest on stage four with Andy’s wee brother Alex having the fastest time! In 67 he ran on the sixth stage and in 68 on the third but although always a battler and a good man to have in your team the years had taken their toll and he was not the runner of yore. With young Turks like Johnston, McMeekin and company he had to yield his place. There are men in the sport today who are not remotely in his class as shown between 1954 and 1960 who are picking up international vests – let’s not forget the John McLarens. Andy Forbes was maybe better known but his brother Chic was one of the most valuable team members in the 1950’s. He latterly moved to Irvine and joined the local club and was a familiar figure at cross-country races for many years. 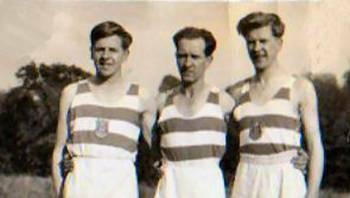 Unlike most of the team though he did not get his Scottish international cross-country vest despite finishing seventh (1950) and fifth (1952) in the National Cross-Country Championship. He was nevertheless an athlete of quality unfortunately overshadowed by his big brother. Again, I’ll let his achievements speak for themselves by setting them out in tabular form. The figures in black are for the national cross-country championships and those in red are for the E-G. Chic ran after 1960 of course but his best years were undoubtedly those of the 50’s when he contributed to seventeen team medals, ten of them gold and his three fastest stages in the relay plus three second fastest and two thirds speak volumes for his consistency. BOBBY CALDERWOOD was roughly contemporaneous with John McLaren and a very fine runner indeed as can be seen by his two runs in the International Cross Country Championships in 1956 and 1957 – in ’56 he was first Scots counter when he finished in 41st position.. Like his good friend Ronnie Kane, he took up coaching after he had finished running competitively as was very highly regarded. Bobby was one of the first athletes to continue racing for his club after he started at University – the practice before the War and just after was for club runners to turn out for the ‘Varsity’ while they were students. The practice was starting to change when he went up to Glasgow University and he was one of the first to break with that particular tradition. 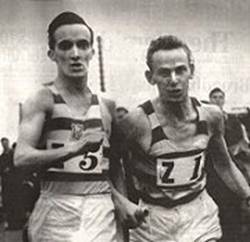 After running as a Youth and Junior Bobby’s first run in the Senior National was in 1956 when as a first year in the age group he was second club counter when he crossed the line in ninth place – four places behind another of the same age, John McLaren – in the winning team. In ’57 he was eighth and again in the victorious squad, in ’58 he was nineteenth to be a counter in the gold medal team for the third consecutive year. There were medals in the following three years but not as bright – ’59 saw him in thirty fifth and second team, ’60 saw another thirty fifth place and bronze and in ’61 it was seventy third for more bronze. As for the Edinburgh to Glasgow, there were another four golds and three bronzes for Bobby. In 1952 a very young Bobby was second on the first stage in the winning team and although he missed the event in 1953, he made up for it with finishing first on the first stage in 1954 to set the team on its winning way. He missed out again in 1955 and then in 1956 he was again second on the first stage as part of another gold medal team performance. 1957 was to be his final gold medal when he again ‘won’ the first stage for the second time. In ’58 he ran the first stage in the team that finished third but unfortunately the records don’t show the individual times below the winning club. In 1959 he was third fastest on the long sixth stage to see the team finish third. The team started to disintegrate at that point and although the team of the 1960’s would prove to be very good by 1960 the team could only finish twelfth with Bobby sixteenth on the first stage that he had dominated six years just a short time before. He ran in more Edinburgh to Glasgow races but because we are focusing here on the teams of the 1950’s, it is maybe appropriate to stop here. Picture below is before the relay in 1953. Jimmy’s results are in black, Norrie in blue and Sid in red and the whole represents a wonderful record of club service from one family – I can’t think of another example. They did not appear so often on the country though – like several of the Victoria Park runners, they kept off the uncertain surfaces and avoided the ditch jumping and fence vaulting that prevailed at the time. 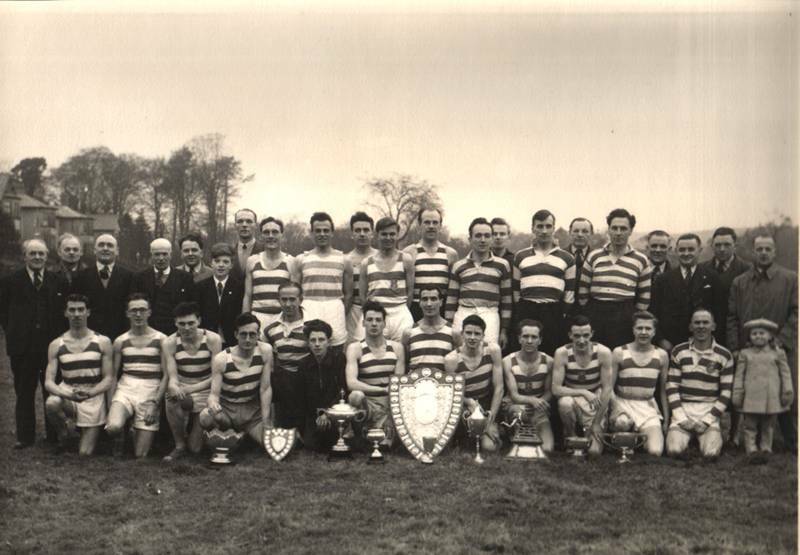 Again, Jimmy was the most active – 15th individual and 3rd counter in the team that tied with Bellahouston Harriers for second place in 1949, 5th and 2nd counter in the winning team in 1951, 7th and 4th counter in the winning team in 1952, 12th and 5th counter in the winning team in 1953 and 13th and 2nd counter in the second placed team in 1954. In this latter year Sid also ran and was 6th counter in 34th place: this was his only run in the Senior National. 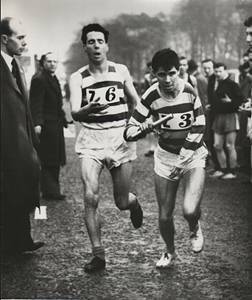 Norrie ran as a Junior being 9th in 1954 and that was the only year when all three competed at the same National. Norrie was also in action in 1956, his only appearance in the Senior team, when he was a non-counter in the winning team with his 34th place. 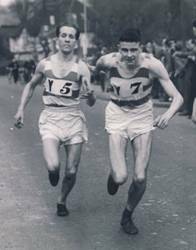 Jimmy was the only man to gain a cross-country international vest and that was in 1951: in the actual event he was one of Scotland’s scoring runners when he was in 46th place. The Victoria Park team of the 1950’s is legendary for their performances on whatever surface although they were generally reckoned, despite their win in the English National, to be better on the road than on the country. The teams of the 60’s and 70’s were also very good indeed and both will be discussed. First of all, Colin Youngson has done the following club profile for the latter day runners. Victoria Park AAC senior men always enjoyed the Edinburgh to Glasgow relay and many of the club’s best runners excelled on the road, although some did very well on the country or track as well. This website includes several VP profiles already, including Ian Binnie, Hugh Barrow, Pat Maclagan, Alastair Johnston, Davie McMeekin and Alastair Douglas. However a scan of the E to G results from 1962 to the late 1980s reveals a number of athletes who thoroughly deserve to be celebrated. These are: Albie Smith, Joe Reilly, Des Austin, Innis Mitchell, George Meredith, Bobby Blair, Laurie Reilly, Willie Sheridan, Frank Brown and Andy Girling. Unless sarcasm was involved, no one ever called Albert Smith (born 18/1/1943) by his proper Christian name – it has always been Albie. He continues to be a real character – challenging, witty, insulting, and yet great company. He trained and raced very hard indeed, especially in the Edinburgh to Glasgow Road Relay. The speed he showed in that great race had its origins in his track career. A key training session was 20x200m, with the first 200m in 30 seconds, followed by 45 seconds for the ‘recovery’ 200m = each lap 75 seconds. That’s five-minute mile pace! According to scotstats, he ran 1.55.8 for 800m (although Albie thinks it was closer to 1.54, but he has kept no records), 3.50.2 for 1500m and 4.16.19 for one mile. However scotstats are wrong, since he won the West District one mile title in 1966, outsprinting the holder Hugh Barrow with 4.13.6. Albie also won the inaugural Glasgow Mile Championship and the Dunbartonshire 1500m. He raced on numerous occasions during the Scotland v England football match at Hampden, in front of 80,000 spectators. He often took part in the Charity Shield Mile at Ibrox, which had 70,000 spectators and his best run there was being outsprinted by Ian McCafferty, but defeating Graham Everett and Hugh Barrow. Another good race was a narrow defeat by Lachie Stewart at Helenvale, when Albie ran two miles in 9 minutes two seconds. In addition, he represented Scotland in a match against the Combined Services, he believes in 1976, winning the 1500m in 3.50.6, after running the last 800m in 1.58 and outsprinting the speedy Jim Dingwall. He regrets that, in those ‘cost-conscious’ days, the SAAA only loaned Scottish vests to athletes and suggests that he won without difficulty because the vest he borrowed must have been worn previously by Ian Stewart! Albie Smith made the final of the SAAA Championships 1500m on ten or more occasions. His best position was fourth in 1973, which was a slow race. With 280 metres to go, he sped into a 35 metre lead and stayed in front until about 20 metres from the finish. Ron MacDonald was the winner. Albie competed for VP in the Scottish League Division 1 on many occasions, doubling up 800m/1500m frequently, as well as breaking 2 minutes/4 minutes easily. Once he also did the shot putt and javelin. While at Strathclyde University, he was awarded his Blue for Track and Field for season 1968-1969, after winning one mile races and finishing second to Dave Logue in the three miles at the 1969 Scottish Universities Championship. He ran 1500m for Scottish Universities in the Combined Universities event at Crystal Palace. Albie was knocked out in the 1500m heats at the 1973 British Universities championships but clocked 3.53. When he turned forty he was victorious in the Scottish Veterans championships at 800m and 1500m. He also came second in the British Veterans 800m. Apparently the guy that won had been a professional and may have been disqualified. Certainly, Albie broke 2 minutes for 800m, which is still a fast time for a vet. In addition, he did a lot of coaching and his best memory involves Ian Archibald and the 1983 SAAA 1500m championship. Ian phoned Albie on the morning of the contest, and a race plan, which worked a treat, was formed. The tactics involved: accelerating hard into the lead at 300m to go; throttling back, while maintaining first position, until 200m; speeding up again for fifty metres and then coasting once more; before giving it everything in the last hundred metres. Ian won going away, outsprinting not only Nat Muir but also John Robson! Albie Smith also achieved success in cross-country. As a Youth, he won team gold with VPAAC in the 1961 SCCU Championships; finished eleventh (well in front of Pat Maclagan) when his team won silver medals in the 1964 Scottish Junior; gained another silver in the 1966 Senior National, when he was a very respectable 22nd; and obtained bronze in 1967. He is one of very few competitors who managed to run the E to G on twenty occasions. His first race was in 1962; his final appearance in 1985. Albie ran every stage except Six. He made an immediate impact in 1962, with third-fastest on Stage Five, when his team were fourth, which unfortunately was a place they ended up in nine times in twenty-one years. Yet during that period they also won three silver and three bronze medals and were never lower than eighth. This is evidence of Victoria Park’s consistency in retaining a place among the very best Scottish teams. Albie himself won three silver and two bronze medals with VPAAC and also ran for Strathclyde University in 1968 and 1969. On Eight, he was fastest in 1972 (equalling Henry Summerhill’s stage record after chasing Scottish 1500m champion Craig Douglas and closing in by 69 seconds), second-fastest in 1971 and third-fastest in 1974. However he was undoubtedly a Stage Three specialist, coping very well with four steeply undulating miles, often into a headwind). When Edinburgh University’s Ian Hathorn broke the Stage Three record in 1966, Albie was second-fastest, only fifteen seconds slower than Hathorn and speedier than Norman Morrison. Albie was fastest in 1967 (eighteen seconds better than Andy McKean) and 1978 (at the age of 35). Add to that second-fastest in 1966 and 1975 and third-fastest in 1970 and 1979. He remains a Vicky Park legend! Joe Reilly (born 8/7/1945) first took part in the E to G in 1964, after a track season when he ran 3 miles in 14.23, as well as winning the Scottish Schools one mile title. He reduced his three miles time to 14.05 in 1965, the year he finished the SAAA Championship 6 miles in 29.09.2 and won a bronze medal. During the next few seasons, Joe also tackled the steeplechase (1967 West District Champion) and produced times of 4 minutes exactly (1500m), 14.50.2 (5000m) and 30.47 (10,000m). He was a good cross-country runner, winning team silver in the Scottish National Youths CC in 1961. Joe produced a splendid performance in 1964 when he ran the ICCU Junior CC for Scotland, finished ninth and his team won silver medals. The fantastic Ian McCafferty won the race, Alec Brown was seventh, and the Scottish team was only one point behind England. This was to be Scotland’s best attempt to win the International title. Previously Joe Reilly had been fourth in the Scottish Junior, not far behind Mel Edwards, Ian McCafferty and Lachie Stewart. Victoria Park were second in the team contest. Then in 1966, VP won the team title in the Scottish Junior National, with Joe eighth. Soon after that, Joe’s family moved to Liverpool and then Manchester and he didn’t come up for the National but concentrated on travelling to Victoria Park’s favourite race (after the McAndrew Relay, naturally) – the E to G. He competed in this seven times. After his debut in 1964 (on Stage 7), he ran in 1965 (fourth-fastest on Two, VP bronze medals), in 1967 on Five (gained two places), and ran strongly on 6 in 1968, with his team fourth, which was the place they obtained again in 1969, when Joe did Stage 7. His last two attempts produced two more medals. VP were third in 1970, with Joe tackling the long Stage Six again. Then in 1971, which featured a terrific battle between Joe’s club and Shettleston, he was second-fastest on Stage Five, overhauling International runner Norman Morrison and moving into the lead, although eventually VP finished a valiant second. Overall, Joe Reilly had proved to be a really good runner. In addition he must have been an inspiration and an adviser to his younger brother Laurence, of whom more later. Des Austin (born 26/10/1943) showed talent as a Junior, with team bronze in 1965 and gold in the SCCU Junior National CC in 1966, when he led the team home in fourth place, with Joe Reilly 8th and Alastair Johnston 11th. In 1966 he ran six miles on the track in a good time: 30.37.6. Des ran in the E to G for VPAAC six times, over a 16 year period! He was third-fastest on Stage Seven in 1965, when his club won bronze medals. A year later he improved to second equal fastest on Seven, and VP secured second place. Then in 1970 it was bronze once more, after Des ran Stage Four. By then, he had moved south to work, running for Manchester, Invicta in Kent and eventually Highgate Harriers in London. However Des Austin became serious about his running once more in the late 1970s. He returned to the E to G in 1978 and promptly won his fourth team medal – silver, this time, with Des tackling the exposed Stage Five, straight into a blizzard, retaining second place and ending up third-fastest, only ten seconds off fastest. Five medals in five attempts was his record in 1980, when VP were third and he ran Stage Six. It is not true that, after Des’s Scottish club could only manage fourth place in 1981, despite his exertions on classy Stage 6 (sixth fastest), Des Austin refused to compete in the race again, since he had finally failed to win a medal! By then, the main focus for Des had become the marathon, although he finished a good 14th for VP in the 1978 Senior National CC at Bellahouston Park. At this time he was the owner of ‘Runners Need’, a specialist sports shop in Camden, London. In 1979 he ran 2.24.58, as well as 10,000m in 30.44. 1980 produced 2.19.30 and in 1981 he was even faster, with 2.19.19. This time was achieved wearing a Scottish International vest: Des finished fifth in the Glasgow International Marathon. Jim McGlynn from Eire was less than a minute in front of him, with Alan Coles (Wales) second, and Rod Stone (Northern Ireland and Cambuslang H), Colin Youngson, Des Austin and Alastair Macfarlane, representing Scotland, finishing closely together. Scotland won the team race and received specially inscribed SAAA gold medals. Des Austin continued to record marathon times in the 2.20s for some years and as a veteran did very well in Chicago (2nd Master), London (third Veteran) and Boston (6th Master). In 1988, he became the owner of ‘Runners Need’, a specialist running retailer in Camden, London. By the time he sold the business, in 2010, there were seven branches and it has continued to expand, so in retirement Des should be able to afford even the most expensive trainers! Innis Mitchell (born 2/2/1948) is an Aberdonian who ran in the Edinburgh to Glasgow Road Relay for a number of clubs: Aberdeen AAC (once), Strathclyde University (four times), Victoria Park (four times) and Glasgow University (twice). He went on to run for Inverness Harriers, then take part in Eventing (with horses!) and now to compete as a racing cyclist. Innis went to Aberdeen Academy when there were a number of good young distance runners who had been influenced by Alastair Wood and his wife Jean through Aberdeen AAC. Innis remembers with gratitude the encouragement he received and the frightening trips to races when Wood was driving. Although Innis Mitchell broke the school record in his Sixth Year, when he ran one mile in 4.31.8, this strong, stocky, determined character had previously shown considerable talent for cross-country. In the Scottish Schools senior championship he was fifth in 1965 at Dalziel High School, Motherwell. Then in 1966, on a course at Perth High School, after a close battle he became Scottish Schoolboys Champion. He followed this with eighth in the Scottish National Youths at Hamilton Racecourse. Innis always reckoned that he had natural stamina, which gave him the edge for a while, but when others started training hard, some of them caught up with him. Nevertheless he continued to run well at University, while acquiring two different qualifications. Innis relished racing in tough conditions and had the unusual distinction of being awarded full blues for cross-country at both Strathclyde and Glasgow. He ran for Scottish Universities on several occasions and one of his best races was when he finished second in the Scottish Universities CC Championships in 1975. Innis also ran on track (5000m in14.58 and 10,000m in 31.07) and road (ten miles in 53 minutes) while at Strathclyde, which had a very lively, sociable group of runners, including Albie Smith, Alastair Johnston, Bobby Blair, Mike Hall, Ron Paton, Murray McNaught, Frank Clement and the sensible and talented captain, John Myatt. Later at Glasgow University, Innis enjoyed the company of several other reprobates who could still run, like Willie Sheridan, John Gunstone , Willie Fothergill, Dave Logue and Raph Murray. In the E to G, Innis was plunged in at the deep end in 1966 when, at the age of eighteen, he ran the final stage for Aberdeen AAC. By only four seconds, he was edged out of the bronze medal position by an experienced racer from Motherwell YMCA. However on his debut for Strathclyde University in 1967, when he ran the First Stage, although the team finished 12th, they were awarded medals for the most meritorious performance. Strath improved to ninth in 1968, with Innis on Four; were eighth in 1969 (Innis on Four again); and up to sixth in 1970 (Four again). After graduating, Innis Mitchell started work in Glasgow and competed for Victoria Park AAC, joining the Fast Pack on the Tuesday and Thursday burn-ups round traditional routes on lamplit pavements near Scotstoun Showgrounds. In addition he developed speed endurance by taking part in those legendary lunchtime repetition sessions on Westerlands grass, with the likes of Lachie Stewart, Alistair Blamire and Dave Logue. Innis was part of the first team that finished second in Vicky Park’s own McAndrew Relay in 1971, although he could hardly have relished trying to fight off Shettleston’s Lachie Stewart on the Second Stage. In 1972 Innis, despite an untied shoelace, played his part in the VP outfit that won the Dunbartonshire CC Relays. Then he ran well in the E to G on Stage Three, gaining four places and recording the third-fastest time. After that, he featured in the team that came second in the 1973 Midland CC Championships. Since the previous record-holders (Reading AC) were not aware of Scottish first-claim rules, in April 1973, Innis qualified as one of the Aberdeen AAC team that fought their way to a new record in the gruelling 850 miles John o’Groats to Land’s End Relay. Then Innis Mitchell studied at Glasgow University, running the E to G for them in 1973 on Stage Four, when they were ninth. In 1974, GU came twelfth, with Innis on Stage One. In the 1975 Senior National CC, he achieved his best position – 35th, and Glasgow University did well to finish fourth team. However that winter, Innis was competing for VP once again: on Stage Four in the E to G, with VP sixth. They improved to fourth in 1976 with Innis retaining that place on Five. Previously he had been 38th in the National CC. His final run for Vicky Park was in the 1977 E to G, on Five again. Innis Mitchell next moved up north, to Dingwall, and ran for Inverness Harriers. He did especially well in hill races, like ? Innis also ran the North District Cross-Country League, North Championships and CC Relays. Achilles tendon injuries brought an end to his serious running career, but Innis Mitchell kept his fitness through speedy Munro-bagging and walking long-distance paths, often with his old friendly rival Colin Youngson. Then he devoted himself to horse-riding and eventing, with considerable success. Having tried mountain-biking and cycle touring, he discovered one-day sportifs, time-trials and handicap road-racing. Innis Mitchell, despite his education and thoughtful nature, will no doubt persist in being daring, fit and tough until he drops! George Meredith (born 14/11/1948) seemed talented enough, if a little casual, in the early 1970s, but had difficulty getting into the good VPAAC senior team. He turned out to be a late bloomer, however. George ran 10,000m in 31.52 in 1969 and made his first appearance in the E to G that year, when he was third-fastest on Stage Five and VP finished fourth. However his next appearance was not until 1978, on Stage Eight, when they won silver medals. George was equal second-fastest after battling into a blizzard. (Later it became clear that he always coped well with bad conditions, caused by weather, steep hills or heavy mud.) In 1979 Meredith was given the responsibility of tackling Stage Six and VP ended up fourth. Yet they won bronze medals in 1980 after George bashed through the exposed Stage Five into a brutal headwind. On the country, George Meredith’s best race was in the 1979 Senior National, when he finished 22nd and was second-counter in his third-placed team. By now, George was living and working in England, near Cambridge. He continued to run cross-country and when he turned forty, headed north to prove his strength and ability. In 1990 the Scottish Veterans CC Championships were held in Dumfries, on a windy, muddy, undulating course. With half a mile to go, there were two left. A fence had to be negotiated, taking off and landing on deep sludge. George Meredith proved equal to the task, while his opponent, the title-holder Colin Youngson, did not, and George, sprinting through the mud, triumphed by six seconds. He went on to run consistently well for Scotland in the annual Five Nations Vets International CC, as well as the Scottish championships (M40 bronze in 1992, M50 silver despite a fall in 1999 – six seconds behind the pitiless Youngson, who had made his break immediately after his friend and rival hit the deck.) George ran in British Veterans contests on track and road. Despite virtually all his training being done on grass, he won a silver medal in the 1990 BVAF 10 miles at Oswestry. George’s indoor rowing sessions are not dissimilar to his running workouts. The 2000m distance, when raced, boils down to about 80% aerobic work, and 20% anaerobic. That ratio results in a fairly hellish degree of oxygen debt, hence James Cracknell’s collapse after a time trial on the BBC’s ‘Gold Fever’ documentary series. To increase his ability to function when lactic acid is telling him otherwise, Meredith favours indoor rowing sessions such as three times 2000m at close to race pace, with six minute rests between each. As with running training, these are done off the back of long, steady sessions that build up a sound aerobic base.” Feel the burn! It all sounds rather masochistic, but old runners whose legs don’t move fast enough to produce any lactic acid could well emulate George Meredith by cross-training with an indoor rowing machine. Laurence Reilly (born 7/8/1954) was an extremely talented runner, which he first proved in 1970, when he ran 1500m in 3.57.6 for second in the AAA Youths at Kirkby, only 0.1 of a second behind the winner, David Glasborrow, whose time was a world age-group record. Laurie won both the Scottish Schools and the SAAA Youths 1500m titles In addition he covered 3000m in 8.36.2, 5000m in 14.57.2 (UK record for a 15 year-old) and 10,000m in 31.19.2 (a world age-group best, set in a time-trial at Scotstoun) – fantastic times for someone of his age. In 1971 he retained his Scottish Schools 1500m title. For the next ten years Laurie continued to produce track bests – his final one was 800m (1.53.2) in 1980. Other fastest times were: 1500m (3.46.8), one mile (4.06.0), 3000m (8.00.4), 5000m (13.54.6) and 10,000m (28.58.75 – tenth on the Scottish all-time list in 1975). He was second in the 1972 AAA Junior 3000m, third in the 1973 AAA Junior 5000m and eighth (running for GB) in the European Junior in Duisberg. Naturally, he also ran for Scotland on the track, as a Senior at 3000m in the 1975 British Cup at Cwmbran, Wales. He won a bronze medal in the 1978 SAAA 5000m. His record in cross-country was very impressive, since he ran the ICCU or IAAF Championships for Scotland eight times in succession, from 1972 to 1979. This included twice as a Junior, with a best position of 20th; and six times as a Senior, with his best place 41st in 1977. Laurie counted for the team six times. In 1974 Jim Brown, Andy McKean and Laurie Reilly defeated England, Spain and Belgium to win the team title for a race over 8000m to celebrate the 75th anniversary of Barcelona FC. Then in 1975, when Ian Stewart became IAAF World CC Champion, Allister Hutton (38th) and Laurie Reilly (43rd), both still Juniors, finished ahead of the other Scottish Senior athletes, when the team obtained sixth place. On the home front, Laurie Reilly had starred. He won the National Youths title in 1971, leading VP to first team. In the National Junior he was third in 1973 (with VPAAC second); first in 1974, in front of Allister Hutton; and second in 1975 (after a great battle with Hutton). Then in the National Senior, his best positions were 4th in 1976 and 6th in 1979 (when VP won team bronze). In addition, to quote Colin Shields, “Laurie Reilly, the slim, pale, scholarly-looking athlete who had nevertheless bettered 29 minutes for 10,000m on the track the previous summer, won the Senior title at the 1976 Western District Championships at Drumpellier Park, Coatbridge. He won the 6 mile race by 23 seconds from Frank Clement (Bellahouston) with Phil Dolan (Clydesdale) in third place.” Oddly, while Laurie was at Strathclyde University, he seems to have joined Shettleston Harriers for the season 1976-77, but only helped them win one race – the 1976 West District CC Relay. In the E to G, Laurie Reilly ran for VP six times. He was on Stage Two in 1972 and again in 1973, when he gained four places and set the third-fastest time on this ‘fast men’s stage’. In 1974 he was fastest on Two, taking 32 seconds out of Ron MacDonald. Laurie was fourth fastest on Six in 1975; moved up two places on Two in 1976; and ran Stage Six in 1978, when he finally gained a team silver medal in this famous race. Laurie Reilly ran for Liverpool Pembroke and Sale Harriers in England, but when he retired (still near his best), Victoria Park AAC had every reason to be proud of his top-class performances in the club colours. Willie Sheridan (born 2/1/1955) was a natural athlete with an elegant stride and, like Aberdeen’s Graham Laing, infuriated those of lesser talent by hardly ever looking in difficulty. He must have trained hard on occasion but on the surface, Willie seemed extremely ‘cool’ before that meaning of the word was prevalent. Yet he incurred no real jealousy, just admiration, due to his modesty and delight in social occasions. Willie first ran for the VP senior team as early as 1972, when he was a first year junior and they finished third in the Allan Scally Road Relay. Then he made his debut in the E to G, on Stage Seven. In the 1973 National Junior CC, he helped his club to win silver medals. 1974 was an excellent year for Willie. In the National Junior CC, he was third behind two very good runners: Laurie Reilly and Allister Hutton. His Glasgow University team came second. At the IAAF World Junior Championships at Monza, Willie ran brilliantly to finish twelfth, with Paul Kenney 13th and the precocious Youth Nat Muir 19th. Unfortunately the Scottish Youth Champion, John Graham, who had beaten Muir in the National, came in 49th and the Scottish team were pipped by Italy for third place by only three points. Willie Sheridan did not return to the National until 1976, when he surprised some by running very well to finish 10th in the Senior race. He had left Glasgow University and formed Westerlands Cross Country Club in 1977. In 1978 Willie was 27th in the Senior and the new club did well to finish tenth. His best National result after that was 13th in 1980. In the E to G, although road was not his favourite surface, Willie ran for Victoria Park once (1972), Glasgow University H&H four times (1973-76) and Westerlands CCC four times (1978-82). His best runs were: fifth on Stage one in 1974; second-fastest to Nat Muir on Six in 1978 (superior to Allister Hutton) in a successful bid to overtake GU for 19th place; and fifth-fastest on Six in 1981. Although he ran the first Glasgow Marathon in well under-three hours, despite wearing an enormous sombrero, and in 1982 ran the event more seriously to finish in 2.26.33, Willie Sheridan was most successful on the track. His personal bests were: 800m in 1.53.9, 1500m in 3.51.1, 3000m in 8.30, 5000m in 14.29 and – his best event – 3000m steeplechase in 8.54.0. He won the 1972 Scottish Schools 2000m steeplechase title; 1974 AAA under-20 5000m; 1976 and 1977 British Universities steeplechase, plus the 1977 5000m; and the Scottish AAA Championship steeplechase in 1976 and 1977. Oh, and the 1978 West District 5000m. Despite being an athlete of considerable class, Willie was always drawn to the social side of the sport, enjoying student activities like the Water of Leith pubcrawl and the ‘Double Hundred’ (100 miles run and 100 pints of real ale downed) on the Isle of Man. He formed Westerlands CC originally for G.U. post-graduates. Look up the club website and click on the amusing profile of the founder – Bill Sheridan. He continues to help out with famous hill races like the Two Breweries and the Greenmantle Dash, and must look back with (occasional and nonchalant) pride on the athletic achievements of his peak years. Bobby Blair (born 5/2/1948) was a real club stalwart who could be relied on for many years to deliver good runs in races on any surface. Since he tended to be quiet, he could easily be underrated and surprise more glamorous athletes with tactical awareness and an effective kick to the finish. Bobby ran for Glasgow Police, Strathclyde Police and Strathclyde University but Victoria Park was his main club and his career is a model for success through perseverance. For example a marathon may have taken him 2.51.07 in 1969 but only 2.30.06 by 1981 – you can often win marathons in such a time nowadays. He ran the steeplechase in 9.45.2, competing in track leagues, and 10,000m in 31.53, although he must have been worth must faster on the road. His record in the Edinburgh to Glasgow Road Relay was lengthy and unusual. In 1967 he made his debut – for Strathclyde University – and the team promptly won medals for the most meritorious performance in twelfth place. Then he ran Stage Six for Glasgow Police (best position twelfth) from 1972-74. After that he appeared for Victoria Park AAC on a variety of stages and nearly always held his place or gained one. Bobby ran for VP at least ten times and maybe twelve! The confusion comes from the fact that in 1988, the results show R. Blair handing to R.Blair at the start of Stage Four, since Robert Blair Junior was now old enough to take part in the great race. In 1991, one of them gained a place on Eight and the year after, a Blair was on the first leg, which meant that between them, father and son had run every single stage of the E to G! Bobby Senior must have taken part in the event between fourteen and sixteen times. The highlights for Bobby were in 1978 and 1980. In the former, he defended second place comfortably on Stage Seven and his team won silver medals. In the latter – and this is the performance that spectators will remember to this day – he took over in second place on the final stage, only thirteen seconds in front of ESH’s Ian Steel, who had won the National CC Senior Boys title in 1978 and who, in 1981 and 1982, went on to run twice in the IAAF World Junior CC. So it was rising young star against experienced club Trojan. Neither could do anything about current senior international Gordon Rimmer (Cambuslang) who charged past them both to claim silver medals, but Steel quickly caught Blair and then expected to run off to third place. Alas for the youngster’s hopes. Bobby simply sheltered behind him, avoided the headwind and waited, and waited, until he delivered a devastating burst, Ian wilted and the older man raced home 32 seconds clear to secure bronze. I remember trying to cheer on my ESH clubmate, while knowing very well that Mr Blair was tough and cunning and liable to outfox the classy but inexperienced novice. Bobby thoroughly deserved his success that day and on every other occasion during a long and respectable racing career. Frank Brown (born 16/5/1955) was a good young runner who did well for VPAAC on a few significant occasions, benefiting from the coaching of Alastair Johnston, and then vanished from the Scottish scene. In the E to G, at the age of only eighteen, he was fastest on Stage Three in 1973, beating amongst others Craig Douglas of the winners ESH. Frank ran the First Stage in both 1974 and 1975, finishing ninth and eighth respectively. His only recorded track bests were 1500m in 4 minutes exactly (1974) and 5000m in 14.58 (1975). Frank’s best run, as a first-year Junior was in the 1974 National, when he finished fifth and was selected to run the IAAF Junior World CC, where he came 53rd, only four places behind John Graham. In the 1975 Scottish Junior National, he was fourteenth. What happened after that? Frank seems to be typical of so many young runners who do not continue as seniors. Andy Girling (born 26/1/1955) was an Englishman who undoubtedly had talent, especially for a brief but very successful period in the marathon. He ran the E to G three times, always on Stage Six: 1982 for VP (fourth-fastest); 1983 for Glasgow University; and 1989 for VP again. In the 1982 Senior National he finished a creditable sixteenth for Glasgow University. Then in 1984 he flowered as a marathon runner of very good class, coming second in the Glasgow Marathon (2.15.41) after making a great effort to win the event. In the 1985 London Marathon he did even better when recording 2.15.38, which resulted in his selection for the GB European Marathon Cup team. Finally in 1986 he won the Florence Marathon in Italy, with an even faster time of 2.15.17, on a slightly short course. Andy Girling’s main English club has been Invicta AC in Kent, and until 2010 he continued to run in the local cross-country league. You will note two links at the foot of the page – the first is an account of a first class athlete called Stuart Barnett who was as good a clubman as any club in the land ever possessed. You should read about this talented and loyal club runner. The second has some articles sent by Colin Young, a sprinter and hurdler in the 1960’s, who has sent a couple of tributes to Andy Forbes and an article by the late Jim Logan on cross-country running at the club. Hugh Barrow has uploaded Alistair Johnston’s video of classic races (McAndrew, E-G, National, etc) to youtube. It is at http://www.youtube.com/results?q=burning+up+the+roads+of+scotstoun The quality varies as you might expect in a film 40 years old with some shot in the near dark of the conclusion of the E-G in late November but really worth seeing. Have a good look.